Jake isn't happy. He's off to Remedial Space Car Driving School. Soooo embarrassment, but when you fail your license thirty times, there really is need for intervention--there's no getting out of it. The School is run on the moon and Jake finds it exactly how it appears in school books--grey and dusty. He tries to make the most of it--it's only one week after all, and he really wants that space car license. To make things more pleasant, he meets some pretty cool kids--Henry from Jupiter, Rory from Mars, and Milly and Skye from Venus--and together they practice in the space car simulators and get along well, but something's strange about Henry. 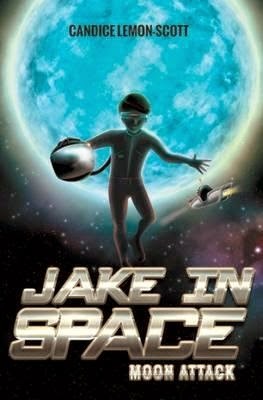 When Jake discovers him walking on the moon without a space suit, he knows something's up--could he be searching for some kind of treasure? Or is he on the trail of an evil mastermind masquerading as a Driving School faciltator? This is a fabulous romp of a book--a really fun adventure that was a pleasure to read. Candice Lemon-Scott has produced well-rounded characters and has included lovely plot twists and drama elements that are clearly-placed and lots of fun for young readers. Plenty of cool space talk will have kids dreaming of a life in the future, where space cars are used by fifth-graders and cyborgs can become good friends. This book would also suit older kids struggling to read.